Salter ES-2500 equestrian scales / large animal vet scales have a large 2500 lb capacity with 0.5 lb readability and a full size, low profile platform for ease of use. The low profile design prevents the high "step up" that makes animals skittish, and the protective mat prevents skidding and protects the animal's feet. Battery or AC operation with a detachable indicator. 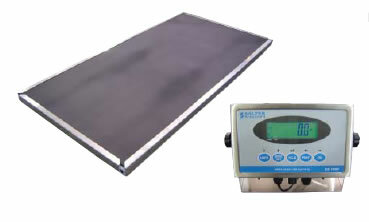 The Salter Brecknell ES-2500 equestrian scale / large animal vet scale has a durable design for rigorous applications. This veterinary scale will insure years of accurate use in even challenging environments. The largest horses average below the capacity limits of this equestrian scale. Good for all breeds. Low profile to avoid high “step up”. Helps limits the shyness of animals when stepping onto strange surfaces. Protective matting for ease on animal hooves. No hard steel surface to allow the animal to slip or damage their feet. A full 0.5” protective diamond surface mat minimizes injuries. Battery operation for remote locations. Full function with no AC power attached. AC adapter is included for charging or full time operations. Detachable indicator for battery charging. The indictor may be removed and placed near AC power for charging. No need to move the entire scale.